“Hereditary” (2018) is an expert horror film that I’m not sure you should see. “Hereditary” (2018) is a difficult movie to review. It’s an exceptionally well made horror film, enough for me to rate it at least a 9 out of 10. But its content is so disturbing that I’m not sure that I can actually recommend it to others. The only flaws that I can think of are extremely minor. The pacing isn’t perfect. (The story occasionally seems to slow when events should be accelerating.) I had problems with the way that one key character was portrayed, and there was one plot point that gave me trouble. (I can’t say more for fear of spoilers.) But these things are so forgivable that they hardly merit a mention here. You simply can’t argue that this movie was expertly assembled. Yet I didn’t always enjoy “Hereditary.” I’d be lying by omission if I didn’t state that. I shut it off more than once, and then came back to it when I felt more able to stomach the brutal events it depicted. I’m closing with a little bit of trivia. Toni Collette gives a tour-de-force performance here as the troubled mother. If she looks familiar to you, that might be because she’s also the mom in another well known supernatural horror film — M. Night Shyamalan’s “The Sixth Sense” (1999). And “Split” looked nearly perfect. James McAvoy handed in a tour-de-force performance as Kevin, a man with dissociative identity disorder (DID). (Yes, I am aware of the clinical controversies connected with whether the disorder even exists — I was a psychology student many, many years ago. I think we should suspend whatever disbelief we have for the purposes of enjoying the movie.) McAvoy plays his role to perfection. His “Dennis” persona is particularly frightening, and “Barry,” one of the “good personalities” he portrays, is surprisingly endearing and sympathetic. I would rate “Split” an 8 out of 10. It suffers a bit, I think, from two missteps toward the end. One, this taut psychological thriller takes an ill-advised turn into dark fantasy. I thought it was amazingly good as a thriller grounded only in the real world — it was far less so with the later jarring story elements. (I do realize why Shyamalan made this creative decision, and you will too, after watching it and then reading up on it.) But I still think that this would have been a perfect film if the majority of it focused on McAvoy’s personalities either aiding or misleading his psychiatrist, with Taylor-Joy’s fate hanging in the balance. Two, this film seemed to suffer from the too-many-endings syndrome that people often associate with Peter Jackson’s “The Lord of the Rings” movies. We seem to have one denouement that works quite well, then a second that should have been re-shot and re-scripted. And then there’s another plot strand finally addressed … but it is played so subtly that I’m not even sure I got it. And this isn’t even counting the significance of the movie’s final line, which works as a fantastic framing device. About that line … if you’re a Shyamalan fan, then you simply must watch the film until it’s very end, as the camera pans through the coffee shop. You’ll love it. 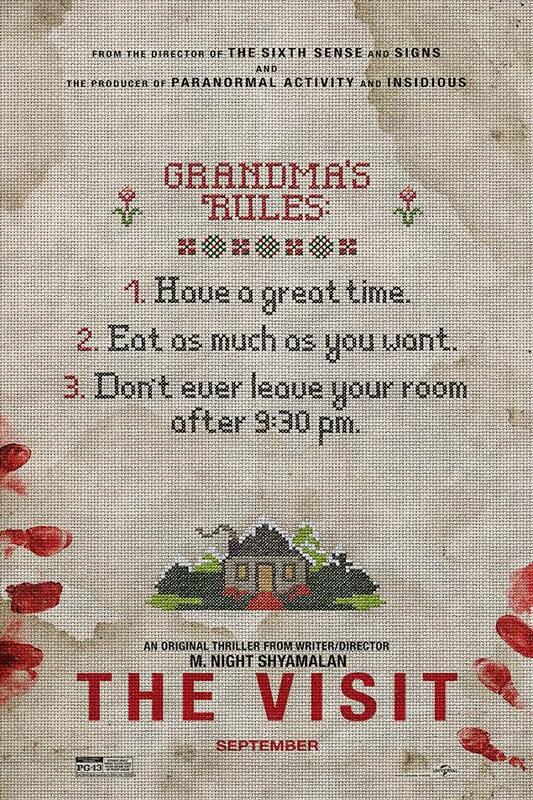 I quite liked M. Night Shyamalan’s “The Visit” (2015); I’d give it an 8 out of 10. It is by no means a perfect movie. But it has all of the elements of Shyamalan’s work that I love: it’s beautifully shot; it has a fresh, creative story; it’s suspenseful; it’s atmospheric, and it has well drawn, likeable protagonists. I am an unashamed Shyamalan fan. I love all his horror-thriller movies, even the one or two in which I can guess Shyamalan’s trademark “twist” in advance. Yes, I even liked “The Village” (2004). And I liked “The Happening” (2006) a hell of lot too. This movie indeed has said twist. I thought I guessed what it was in the opening minutes. I was wrong, and when the real twist was revealed, it was pretty damn effective. For a moment, I was as dumbfounded as the characters on screen. This was despite the fact that all the clues had been right there in front of me, and seem obvious in retrospect. A couple of things nudged this movie just slightly left of the “great” category, into the “good but not great” category. For one, I think this could have been a short film, and didn’t need more than 40 minutes or an hour to tell its story. The pacing seems to suffer a little because of that. For the first hour, we keep revisiting the same arc in tension: a grandparent behaves strangely, a grandchild queries them, and then the behavior subsides. Character choices are also implausible. These are bright, savvy kids, who are either oblivious to or cavalier about obvious signs of danger. I think any person in real life would be too frightened to remain in the house where “The Visit” takes place. Later, certain things change a little too conveniently after the twist is revealed. Still, I’d recommend this. If you can overlook the movie’s faults here and there, you’ll enjoy a damn creepy modern fairytale.